In blender, combine olive oil and mint. Process until smooth. Cover and refrigerate. In bowl, combine strawberries and sugar, cover and set aside. Plate 4 ounces mozzarella, overlapping slices. Spoon 1/2 cup sugared strawberries around cheese. 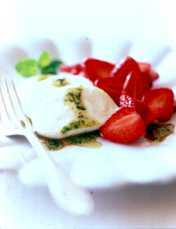 Drizzle 2 tablespoons Mint Drizzle and 1/2 teaspoon balsamic vinegar over cheese and strawberries. Garnish with mint sprigs, as desired.